Excel OFFSET function can be used when you want to get a reference which offsets specified number of rows and columns from the starting point. It returns the reference that OFFSET function points to. reference – The reference from which you want to offset. This could be a cell reference or a range of adjacent cells. rows – the number of rows to offset. 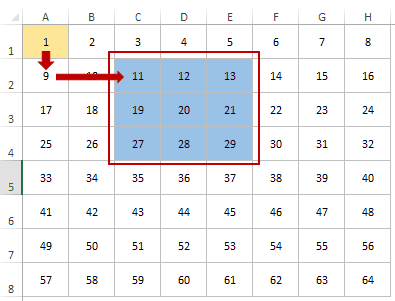 If you use a positive number it offsets to the rows below, and if a negative number is used, then it offsets to the rows above. cols – the number of columns to offset. If you use a positive number it offsets to the columns to the right, and if a negative number is used, then it offsets to the columns on the left. [height] – this is a number that represents the number of rows in the returned reference. [width] – this is a number that represents the number of columns in the returned reference. 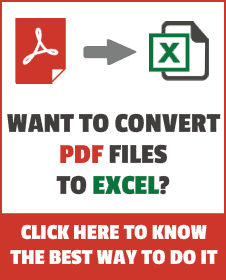 Excel OFFSET function is possibly one of the most confusing functions in Excel. Let’s take a simple example of a Chess game. There is a piece in Chess called a Rook (also known as a tower, marquess, or rector). Now, as all the other Chess pieces, a Rook has a fixed path on which it can move around on the board. 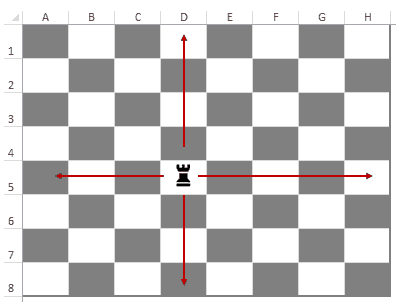 It can go straight (to the right/left or up/down the board), but it can not go diagonally. 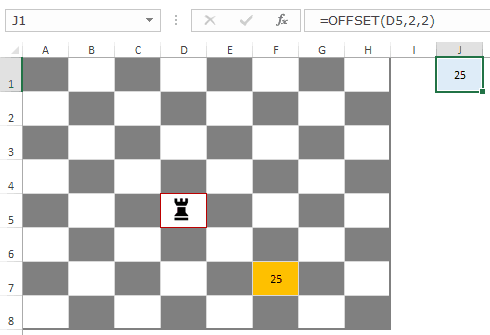 For example, suppose we have a chess board in Excel (as shown below), in a given box (D5 in this case), the Rook can only go in the four highlighted directions. 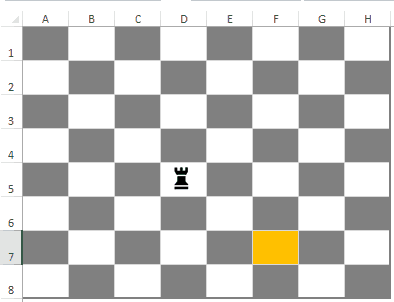 Now if I ask you to take the Rook from it’s current position to the one highlighted in yellow, what will you tell the rook? You’ll ask it to take two steps downwards and two steps to the right.. isn’t it? And that’s a close proximation of how the OFFSET function works. Now let’s see what this means in Excel. I want to start with the cell D5 (which is where the Rook is) and then go two rows down and two columns to the right and fetch the value from the cell there. As you can see, the formula in the above example in cell J1 is =OFFSET(D5,2,2). It started at D5, and then went two rows down and two columns to the right and reached the cell F7. It then returned the value in cell F7. In the above example, we looked at the OFFSET function with 3 arguments. But there are two more optional arguments that can be used. 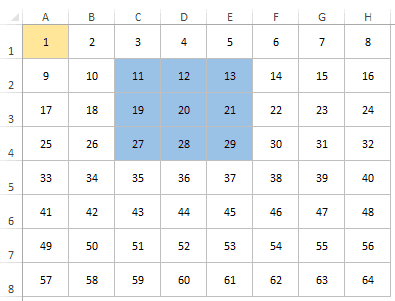 Suppose you want to use the reference to cell A1 (in yellow) and you want to refer to the entire range highlighted in blue (C2:E4) in a formula. How would you do that using a keyboard? You would first go to cell C2, and then select all the cells in C2:E4. If you use this formula in a cell, it will return a #VALUE! error, but if you get into the edit mode and select the formula and press F9, you’ll see that it returns all the values that are highlighted in blue. The first argument is the cell where it should start. The second argument is 1, which tells Excel to return a reference which has been OFFSET by 1 row. The third argument is 2, which tells Excel to return a reference which has been OFFSET by 2 columns. The fourth argument is 3. This specifies that the reference should cover 3 rows. This is called the height argument. The fifth argument is 3. This specifies that the reference should cover 3 columns. This is called the width argument. Now that you have the reference to a range of cells (C2:E4), you can use it within other function (such as SUM, COUNT, MAX, AVERAGE). 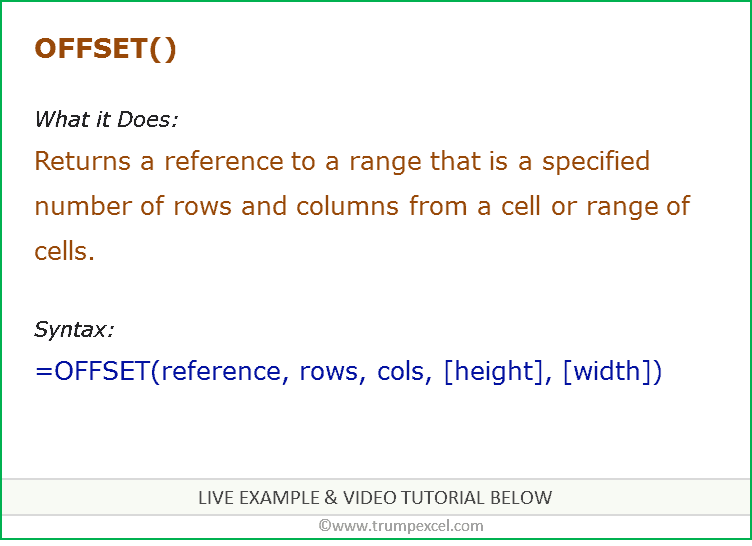 Hopefully, you have a good basic understanding of using the Excel OFFSET function. Now let’s have a look at some practical examples of using the OFFSET function. Here are two examples of using Excel OFFSET function. 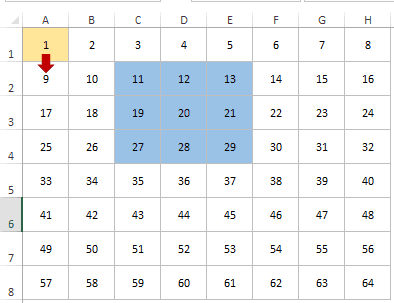 This formula assumes that there are no values apart from the ones shown and these cells do not have a blank cell in it. It works by counting the total number of cells that are filled, and offsets the cell A1 accordingly. For example, it this case, there are 8 values, so COUNT(A:A) returns 8. We Offset the cell A1 by 7 to get the last value. You can extend the concept shows in Example 1 to create dynamic named ranges. These could be useful if you are using the named ranges in formulas or in creating drop-downs and you are likely to add/delete data from the reference that makes the named range. Note that the drop down adjusts automatically when the year is added or removed. This happens as the formula that is used to create the drop down is dynamic and identifies any addition or deletion and adjusts the range accordingly. Select the cell where you want to insert the drop down. In the Data Validation dialog box, within the Settings tab select List from the drop down. The first three arguments of the OFFSET function are A1, 0 and 0. This essentially means that it would return the same reference cell (which is A1). The fourth argument is for height and here the COUNT function returns the total number of items in the list. It assumes that there are no blanks in the list. The fifth argument is 1, which indicates that the column width should be one. OFFSET is a volatile function (use with caution). It recalculates whenever the excel workbook is open or whenever a calculation is triggered in the worksheet. This could add to the processing time and slow down your workbook. If the height or width value is omitted, it is taken as that of the reference. If rows and cols are negative numbers then the offset direction is reversed. INDEX Function: INDEX function can also be used to return a cell reference. Click here to see an example on how to create a dynamic named range using the INDEX function. Excel Table: If you use structured references in Excel Table, you need not worry about new data being added and the need to adjust the formulas. Create a Scroll Bar using Excel OFFSET Function. Creating Dynamic Chart Range using OFFSET.